The significance of hemotrophic mycoplasma in cattle remains unclear. Especially in Europe, their epidemiological parameters as well as pathophysiological influence on cows are lacking. The objectives of this study were: (1) to describe the prevalence of ‘Candidatus Mycoplasma haemobos’ (‘C. M. haemobos’) and Mycoplasma wenyonii (M. wenyonii) in Bavaria, Germany; (2) to evaluate their association with several blood parameters; (3) to explore the potential of vertical transmission in Simmental cattle; and (4) to evaluate the accuracy of acridine-orange-stained blood smears compared to real-time polymerase chain reaction (PCR) results to detect hemotrophic mycoplasma. A total of 410 ethylenediaminetetraacetic acid-blood samples from cows from 41 herds were evaluated by hematology, acridine-orange-stained blood smears, and real-time PCR. Additionally, blood samples were taken from dry cows of six dairy farms with positive test results for hemotrophic mycoplasma to investigate vertical transmission of infection. The period prevalence of both species was 60.24% (247/410), C. M. haemobos 56.59% (232/410), M. wenyonii 8.54% (35/410) and for coinfection 4.88% (20/410). Of the relevant blood parameters, only mean cell volume (MCV), mean cell hemoglobin (MCH), and white blood cell count (WBC) showed differences between the groups of infected and non-infected individuals. There were lower values of MCV (P < 0.01) and MCH (P < 0.01) and higher values of WBC (P < 0.05) in ‘C. M. haemobos’-infected cows. In contrast, co-infected individuals had only higher WBC (P < 0.05). In M. wenyonii-positive blood samples, MCH was significantly lower (P < 0.05). Vertical transmission of ‘C. M. haemobos’ was confirmed in two calves. The acridine-orange-method had a low sensitivity (37.39%), specificity (65.97%), positive predictive value (63.70%) and negative predictive value (39.75%) compared to PCR. ‘Candidatus Mycoplasma haemobos’ was more prevalent than M. wenyonii in Bavarian Simmental cattle, but infection had little impact on evaluated blood parameters. Vertical transmission of the infection was rare. Real-time PCR is the preferred diagnostic method compared to the acridine-orange-method. Mycoplasma wenyonii (M. wenyonii) [1–3] and the recently discovered, not yet fully classified, species ‘Candidatus Mycoplasma haemobos’ (‘C. M. haemobos’) [4, 5] have been described as major hemotrophic mycoplasma in cattle. Hemotrophic mycoplasma infections have been associated with various unspecific clinical signs and resulting clinical relevance. Decline in milk yield, reproductive inefficiency, weight loss, transient fever, rough hair coat, vaginal bleeding, regenerative anemia, icterus, and reduced body weight at birth of infected calves were associated with a single infection or coinfection of M. wenyonii and ‘C. M. haemobos’ [6–12]. Some studies did not find any correlation between an infection with either ‘C. M. haemobos’ or M. wenyonii and the occurrence of regenerative anemia or changes of various blood parameters in cattle [6, 10, 11, 13, 14]. In contrast, coinfection with Anaplasma (A.) marginale was shown to enhance anemia and to be potentially fatal [15, 16]. However, infection with bovine leukemia virus was unlikely to be a risk factor. Both hemotrophic mycoplasmas have been described to be transmitted either horizontally by insects or vertically/transplacentally [13, 17, 18]. Among described risk factors, cattle in indoor housing and cattle aged 1–3 years seem to be more likely to get infected than pasture-based or older cattle, respectively . The prevalence of infection varies by study and country. A recent Japanese study found a prevalence of 69.4% in 36 cows in Hiroshima and 93.8% in 32 cows in Miyazaki . Another larger Japanese study with 343 cows also found a 64.7% prevalence with hemotrophic mycoplasmas—almost evenly attributed to M. wenyonii (38.5%) and ‘C. M. haemobos’ (39.1%) . Similarly, a large Brazilian study with 433 cows described a prevalence of ‘C. M. haemobos’ of 60.97% . The diagnosis of hemotrophic mycoplasma infection has traditionally been made by the visual assessment of acridine-orange-stained blood smears with fluorescence microscopy . Here, contrast-stained, dot-like deposits on erythrocytes are visible. However, the risk of misinterpretation of artifacts or other infections is high [23, 24]. Therefore, hemotrophic mycoplasmas are currently identified with either 16S rDNA polymerase chain reaction (PCR)  or real-time PCR . The latter seems to be superior to the former in cats  and cattle , but confirmative data are lacking. Due to the limited information of the infection in Bavarian cattle, the objectives of this study were (1) determine the prevalence of ‘C. M. haemobos’ and M. wenyonii in Bavarian Simmental cattle, (2) evaluate the association of infection with hematological parameters, (3) evaluate the likelihood of transplacental transmission, and (4) evaluate the accuracy of detecting hemotrophic mycoplasma by acridine-orange-stained blood smears compared to real-time PCR results. 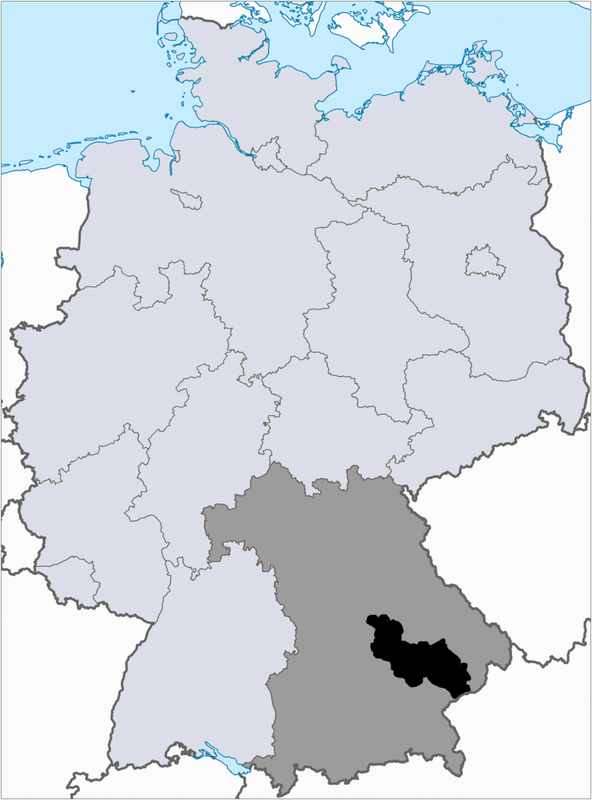 A convenience sample of 41 dairy farms from the four South-Eastern-Bavarian administrative districts Kehlheim, Landshut, Dingolfing-Landau, and Rottal-Inn were enrolled (Fig. 1). Farms were clients of the Bavarian Animal Health Services that were willing to participate. At each farm 9 mL ethylenediaminetetraacetic acid (EDTA) blood samples were taken from 10 adult Simmental dairy cows during routine herd health visits from September 15, 2015 until July 11, 2016. Furthermore, on six farms with a history of hemotrophic mycoplasma infection, EDTA blood samples were collected from dry cows and their calves immediately post natum, prior to the first feeding of colostrum. All samples were delivered immediately to the laboratory by our courier service and were processed within 24 h after drawing of blood, including blood smears. Each blood sample was analyzed for erythrocyte count (RBC), hemoglobin (Hb), hematocrit (Hct), mean cell volume (MCV), red blood cell distribution width (RDW), mean cell hemoglobin concentration (MCHC), mean cell hemoglobin (MCH), reticulocyte (Retic), platelet as well as white blood cell count (WBC) by automatic blood cell counter (IDEXX ProCyte Dx; IDEXX GmbH, Ludwigsburg, Germany). Additionally, blood smears were stained with acridine orange (Carl Roth GmbH & Co. KG, Karlsruhe, Germany). Briefly, blood smears were fixed with ethanol for 1 min and then air dried. Acridine orange solution (0.25 mg/mL) was applied for 30 min in the dark. Subsequently, the slides were rinsed with water, air dried, and evaluated under ultraviolet (UV) light excitation with a fluorescence microscope for erythrocytes infected with hemotrophic mycoplasma. Furthermore, aliquots of the blood samples were tested by quantitative real-time PCR as described previously . Briefly, for DNA extraction, 200 µL of EDTA-anticoagulated blood was mixed with an equal volume of lysis buffer (10 mM Tris pH 7.5, 5 mM MgCl2, 330 mM sucrose, 1% (v/v) Triton X-100) and centrifuged (8000×g, 21 °C, 1 min). DNA was purified from the pellet using the GenElute™ Bacterial Genomic DNA Kit (Sigma-Aldrich, Steinheim, Germany). To determine cross reaction, one PBS control was included in each extraction run (10 samples). ‘C. M. haemobos’ and M. wenyonii were quantitatively detected with the StepOne™ System (Applied Biosystems, Foster City, USA). The reaction mixture (20 µL) contained 10 µL of the 2× SYBR Green PCR Master Mix (Thermo Fisher, Munich, Germany), 0.5 µM of primer each, and 2 µL of template DNA. Dilutions of plasmid DNA defining 105, 104, 103 genome equivalents (GE) per reaction were included as standards into the runs. Based on the results of the real-time PCR, cattle were categorized into ‘infection negative’ (no detection of ‘C. M. haemobos’ or M. wenyonii), ‘infection total’ (detection of either ‘C. M. haemobos’ or M. wenyonii), ‘C. M. haemobos’ (only detection of ‘C. M. haemobos’), M. wenyonii (only detection of M. wenyonii) and ‘coinfection’ (detection of both ‘C. M. haemobos’ and M. wenyonii). All data were recorded in Microsoft EXCEL Microsoft Home and Student 2010, Version 14.0.7208.5000 (32 Bit), Microsoft Corporation 2010 and statistically analyzed in R× 64 Version 3.3.1 and RStudio Version 1.0.136 enhanced by packages “caret” and “e1071”. Level of significance was defined as α = 0.05. Prevalence was calculated from the whole dataset of 410 samples. Statistical analysis of every other parameter but blood stains were calculated from a dataset of 409 samples. No blood cell count results were available in one sample due to technical problems. The Shapiro–Wilks-test was performed to test for normal distribution of subgroups ‘infected’ or ‘non-infected’ for hematological parameters and indices. If normal distribution in both subgroups was confirmed, homoscedasticity was examined by Bartlett’s-test. If normal distribution was rejected for one or both subgroups, Fligner-Killeen’s-test was calculated. If there was no homogeneity of variances in normally distributed data, Welch’s t test was calculated. 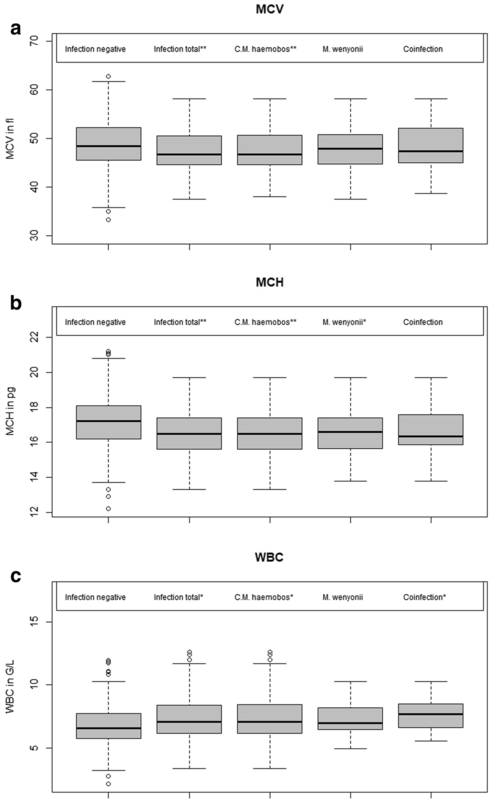 Whether or not infection with hemotrophic mycoplasmas was associated with hematological parameters was determined by computing Student’s or Welch’s independent two-sample-t-test if both subgroups were normally distributed. If one or both subgroups were not normally distributed, Wilcoxon’s rank-sum-test for independent samples was performed. In order to visualize relevant results, boxplots were generated, and its quantiles and medians were shown in numbers. To assess intrauterine transmission, data was analyzed by Fisher’s-exact-test. The test was computed for blood samples positive for ‘C. M. haemobos’ or M. wenyonii separately. If identical species were demonstrated in corresponding blood-samples of cows and calves, transplacental transmission of hemotrophic mycoplasma in cattle was assumed. The accuracy of detecting hemotrophic mycoplasmas via acridine-orange-stained blood smears was evaluated with a reduced dataset containing only 374 blood samples from 38 dairy farms, since no acridine-orange-stained blood smear evaluation was performed in the missing 36 blood samples due to laboratory problems. Reference values for this were generated by real-time PCR-testing. To specify the validation of the acridine-orange-method by the real-time PCR test-results, sensitivity, specificity, positive predictive value, and negative predictive value were determined compared to the real-time PCR as a gold standard by McNemar’s test and Cohen’s Kappa. Without accounting for herd, 60.24% (247/410) of cows tested positive by real-time PCR at least once for hemotrophic mycoplasma. More specifically, 56.59% (232/410) of cows were positive for ‘C. M. haemobos’, while 8.54% (35/410) and 4.88% (20/410) were positive for M. wenyonii or mixed infections, respectively. ‘C. M. haemobos’ was found in all tested herds (n = 41), while M. wenyonii was only detected in 16 of 41 farms. In comparison with the PCR detection, acridine-orange-stained blood smears showed a sensitivity of 37.39%, a specificity of 65.97%, a positive predictive value of 63.70%, and a negative predictive value of 39.75%. One hundred thirty-five blood smears were positive and 239 were negative for hemotrophic mycoplasma in contrast to 144 and 230 by real-time PCR, respectively. McNemar’s test P-value was < 0.0001 and Cohen’s Kappa was 0.0299. No differences were found for Hct, Hb, Retic, RBCs, and MCHC between infected and non-infected cows. ‘C. M. haemobos’ real-time-PCR positive cows showed lower values for MCV (P < 0.01), MCH (P < 0.01) and higher values for WBC (P < 0.05) (Fig. 2a–c, Table 1) while cows positive for M. wenyonii had lower MCH than ‘infection negative’ individuals (P < 0.05) (Fig. 2a, Table 1). In co-infected animals, only WBC was higher than in ‘infection negative’ individuals (P < 0.05) (Fig. 2c, Table 1). Finally, 50 dry cows were tested for a potential transplacental transmission. Of these, 18 cows (36.0%) were positive for ‘C. M. haemobos’, two cows were positive for M. wenyonii (4.0%), and seven cows were positive for both ‘C. M. haemobos’ and M. wenyonii (14.0%). It was possible to take 25 blood samples of corresponding newborn calves. Two of the tested calves were positive for ‘C. M. haemobos’ (Table 2)-one was born to a co-infected mother while the other calf came from a PCR-negative cow. All 25 calves were negative for M. wenyonii. The study provided data on hemotrophic mycoplasma in Bavarian Simmental cattle for the first time. The total prevalence of 60.24% for hemotrophic mycoplasma in Bavarian Simmentals was similar to that in Brazilian cattle  but slightly lower than that reported for Japan (69.4%, and 93.8%  and 64.7% ). Interestingly, the prevalence of the single species differed from those previously published in Japan, where ‘C. M. haemobos’ and M. wenyonii were evenly distributed. In contrast, in the current study ‘C. M. haemobos’ was much more prevalent than M. wenyonii or co-infections. These observed differences could be due to differences in climate, which could favor vector borne transmission, breed susceptibility, different housing systems (barn vs. pasture), or a higher proportion of younger animals in Japan than in Bavaria, but we did not collect specific data to support this hypothesis in this study [17, 20]. Because every sampled herd except one was only barn-housed, tick borne transmission can be neglected as a route of infection, whereas fly bites cannot be excluded. Furthermore, unlike other studies [6–9, 11, 15, 16, 20], no association between infection status and anemia was observed. Instead, the observations of this study supported the results of other authors, especially for M. wenyonii, that also did not find an association [11, 12, 14]. However, there seems to be interaction between hemotrophic mycoplasma and erythrocytes, as both MCV and MCH decreased in the groups ‘infection total’ and ‘C. M. haemobos’. Similarly, MCH decreased in the M. wenyonii group. The lack of statistical difference in MCV or WBC between M. wenyonii’s and co-infected or ‘non-infected’ cows might be due to the small sample size of M. wenyonii-infected animals. The WBC increased, at least numerically, showing the highest levels in the group of co-infected cows. This may be a consequence of a presumably stronger stimulation of immunity by coinfection and consequently higher numbers of leukocytes. Future studies need to investigate whether anemia is dependent on co-infection of hemotrophic mycoplasma with other bacteria or on additional external factors, such as breed susceptibility. The observations of this study underlined again the limitations of acridine-orange stained blood smears for the detection of hemotrophic mycoplasma [23, 24, 29]. Since blood smears were made just after arrival of the blood samples at the laboratory, EDTA-caused detachment of hemotrophic mycoplasma from parts of the erythrocyte membranes could have contributed to the above-mentioned limitations in comparison to real-time PCR, by producing false negative results. The results of McNemar’s test and Cohen’s Kappa indicate significant difference between the two methods (acridin-orange-stained blood smears vs. real-time PCR) and poor inter-rater agreement, respectively. The results also support previously reported vertical transmission of ‘C. M. haemobos’ in Simmental cattle. Similarly to another study, one calf that tested positive by real-time PCR for ‘C. M. haemobos’ was born from a negatively tested mother in this study . One might speculate that the bacterial load was below the detection threshold of real-time PCR or indeed not present, when the blood sample was collected from the PCR negative dam. The obvious low frequency of transplacental transmission of ‘C. M. haemobos’ in cattle suggests that vertical infection is a minor pathway of infection. The low prevalence of M. wenyonii did not allow us to make inferences about transplacental transmission of M. wenyonii in cattle. Further investigations are needed to clarify this pathway of infection. ‘Candidatus Mycoplasma haemobos’ was more prevalent than M. wenyonii in Bavarian Simmental cattle, but an infection had little impact on evaluated blood parameters. Vertical transmission of the infection was observed for ‘C. M. haemobos’. Real-time PCR was found to be the preferred diagnostic method over the acridine-orange-detection method. FMN contributed to the study design, study execution, data analysis, and data interpretation and wrote the manuscript. JA developed and performed real-time PCR and contributed to writing the manuscript. LEH contributed to the study design and revised the manuscript. BS contributed to study execution and data interpretation and contributed to writing the manuscript. All authors read and approved the final manuscript. The authors thank Astrid Nagel, Birgit Isele-Rüegg, Anitta Mathias, and Christa Schäfer for excellent technical assistance. Furthermore, we are grateful for broad encouragement and cooperation provided by the farmers and critical revision of the manuscript by Ulrike Sorge, Ingrid Lorenz, and Jens Böttcher. We adhered to best clinical practices and complied with Directive 2010/63/EU. In accordance with Directive 2010/63/EU, Article 1, 5. (f), approval of an ethics committee is not mandatory. Development of study design and execution, blood sample collection, and hematological analysis were financially supported by the Free State of Bavaria and the Bavarian Joint Founding Scheme for the Control and Eradication of Contagious Livestock Diseases.